You can copy/paste any of the messages from here and add a personal sentence on why you’re recommending this workshop if you have time. I’m so grateful for any of your assistance in spreading the word about these workshops! Note:The best way to spread the word on this workshop is a direct email to a few people you think might be the best fit. Why is niching so hard? 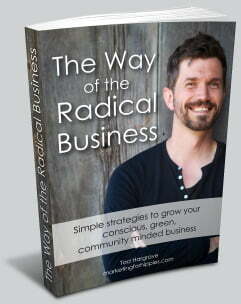 My colleague Tad Hargrave of Marketing for Hippies is coming to Toronto on September 2nd with his daylong, pay-what-you-can workshop all about helping conscious entrepreneur types (e.g. holistic practitioners, life coaches, permaculturists etc.) take some big steps towards figuring out their best niche. It’s called The Niching Spiral. 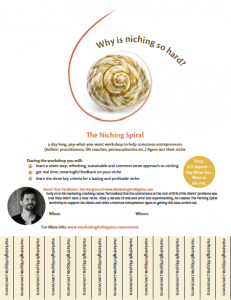 If you’ve struggled with niching, I urge you to check it out. Every hour spent clarifying your niche will save ten hours later. Every $1 will bring you back $10. Note:If you can tag key people in the comments below this post, it will go a long way to making sure the right people see it. Note:If you hashtag the city and some key words for the community you’re targeting with these tweets, it will go a long way towards making sure the right people see it.